Riviera di Salò or Communitas Riperiæ Lacus Gardæ Brixiensis and formerly Communitas Riperiæ Benaci, born November 4, 1334 with capital Maderno from the union of 34 communities of the Riviera and part of the Valle Sabbia who did not want to belong either to Brescia or Verona, they decide then to ally with Venice, which will send a provider; will end in May 1797. The alliance with Venice brings great benefit to the Riviera, also present in military campaigns alongside the Serenissima and that sees its representatives present at meetings with the leading exponents of the politics of the time. After the year one thousand, at a time when the territory of Brescia was crossed by soldiers of all kinds, of all origins and oppressed by the evils of war, the Riviera di Salò deems it necessary to strengthen the bonds of brotherhood that linked their minor communities with each other. he decides to set himself up for a small province, with well-defined borders and with Maderno’s capital, given that this was the village that enjoyed ancient privileges and immunities. For this purpose, the statutes will be issued, civil and criminal, to regulate public affairs and private life with the assets of its inhabitants. The origin of this constituent activity can be traced back to the diplomas that formerly Federico I Barbarossa (1122-1190) during his first descent in Italy in 1154 granted to the cities that remained loyal to him during the period of the Lombard League, such as the castle di Scovolo, followed by those of Frederick II (1194-1250) in 1221 in Scovolo and 1232 in Maderno, who recognized these villages as independent and independent. Towards the middle of the 13th century, the civil conflict between the Guelph and Ghibelline factions led by the Ezzelino III da Romano, then by the Scala family, and by the Visconti family since 1277, was born in all the cities of the peninsula. The hostilities between Brescia Guelfa and the Ghibelline Riviera did not subside and after its submission to the city, the possession of castella and their transfer to the Guelph partisans were forbidden; this situation continued until 1330, when Alberto II and Mastino II della Scala occupied a good part of the Riviera up to Valle Sabbia. Given the risk of occupation not only of Veronesi, Bresciani, Milanesi, but also of foreigners, the Riviera decides to turn to the Republic of Venice, example at that time of wise and strong government and, November 4, 1334 the General Council proclaims the Statutes . The latter responds to the request by giving indications for the restoration of social peace, with the repatriation of the confined or exiled for minor crimes and the confirmation of the sentence for those who had instead held important roles in delinquency. The request of the Serenissima regarding the Statutes is simply to write two copies of which one must be kept at the Chancellery of the Republic and the other at Maderno and that no one could make any changes unless first approved by the Serenissima; the first Podestà of Venice entered in Maderno is Nicolò Barbaro in 1336 but in 1377 Brescia dedicated himself to the Visconti. Because of its geographical position, however, the Riviera is not easily defensible by the Venetians, so much so that for a certain period Venice must suspend its protection as it is engaged on other fronts and this benefits Bernabò Visconti (1323-1385), married to Beatrice ( 1331-1384) daughter of Mastino della Scala, who subjugated her around 1350, but whose power she was able only in 1354 to the death of her uncle, Archbishop Giovanni; this even if in 1351 the emperor Charles IV granted to Mastino II della Scala to dispose of the whole Garda (ab a ripa territories veronensis usque ad alteram brixiensis), period in which the first Captain of the Lake was elected. Bernabò is a character of restless and cruel nature and under his rule the population of the Riviera rebels, also exploiting the league formed against him by Estensi, Pope Urban V, Scaligeri, Gonzaga and Carraresi; in 1362 the Scaligeri lay siege to Salò, who remained in favor of the Visconti, turning their fate in their favor. In 1375, at the death of Cansignorio della Scala, Bernabò tried to boast succession rights on the Riviera but was opposed by Bartolomeo II della Scala who advanced destroying Rivoltella and Desenzano and aiming at Brescia where the Visconti army was encamped; Beatrice, to whom Bernabò had sold the Riviera, goes to Salò, reinforces and enlarges the castle walls and, as a thank you for the help previously given to her husband, elects the capital of the Riviera, a title that will remain until the end. During Beatrice’s rule there is a period of prosperous tranquility, but on his death on 18 June 1384 Bernabò ceded the Riviera to his son Gianmastino, barely ten years old. The nephew Gian Galeazzo (1351-Melegnano 1402) March 16, 1385 enters Milan, poisoning Uncle Bernabò and establish himself as a sovereign prince; during the funeral of the duke the representatives of Salò have a place of greater importance than those of Brescia and Verona. 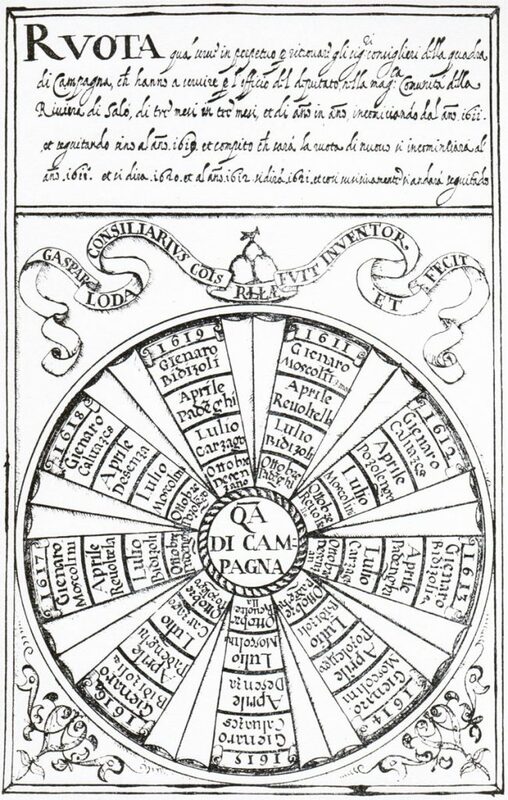 Given the new political situation, the riparians have to adapt their statutes and for this they elect a commission already in September 1385 which, within a few months, manages to modify the Criminal Statutes, the Civil Statutes and also those for food supplies and duties “Statuta vectualium”, presenting them to Gian Galeazzo Visconti who ratifies them as early as April 9, 1386; later will be made additions and changes by both Galeazzo and his successor Filippo Maria (1392-1447), but essentially remain those until the subsequent return of the Riviera under the protection of the Serenissima in 1426. From this moment the Riviera Benacense must receive the Podestà no more from Venice but from Brescia; the Podestà is imposed by Brescia as compensation for the help in the Venetian-Visconti war of 1438, against the will of the Riviera, which instead wants a Venetian podestà, is appointed by the council of the city of Brescia and chosen among the patricians, who unwillingly accept the commission because, as he had to write of the riparian Giovan Francesco Paratico, podestà in 1543, “… haunted and inimical to his superiors and of nature proterves” (for an ancient privilege, Maderno, Muslone and Tignale did not depend on the podestà of Salò for civil cases, but they had their own judge with the title of vicar). In 1438 Filippo Maria sent Piccinino to besiege Brescia, then Venice to defend it and recover the castle of Salò organizes the “Galea per montes” which, passing from the Adige to the lake of Loppio and then from the valley of S.Lucia, brings a fleet in Torbole. The Piccinino and Taliano del Friuli, however, make the Venetian effort vain with their resounding defeat; on April 10th 1440, when the surviving ships were added and others were added, another great battle took place where the Milanese fleet was almost completely destroyed. The castle of Salò was also freed. October 20, 1443, the conflict for this magistrate, the Podestà of Brescia, inviso to the Benacensi, resolves with the rescript that instructs a Venetian noble captain to divide the jurisdiction with the Podestà of Brescia; both live in Salò, in the Palazzo del Podestà. The Riviera gets a partial independence from Brescia and re-hosts the Captain of the Riviera and Provveditore di Salò sent by the Venetian Senate. In this period the Riviera gets the title of “Magnifica” and “Firstborn daughter of the Serenissima” and various autonomies, so much so that it became almost a state in itself. The two figures are therefore that of the Provveditore e Capitano, sent from Venice and that of the Podestà, sent by Brescia. The Provveditore deals with the Statute Criminalia, the administration of public finance and justice; the Podestà deals with civil justice instead. On April 9, 1454, the Peace of Lodi was stipulated, with which the end of the Lombardy wars, the clash between Venice and Milan, and a period of peace for forty years. In 1473 the custom of the residence of the Provveditore ceased to govern part (one year) in Maderno and part (one year) in Salò, and definitively moved to Salò. At the beginning of the 16th century, at the behest of Pope Julius II, they joined the League of Cambrai against the Serenissima, the Emperor Maximilian I of Habsburg, Louis XII of France, Ferdinand II of Aragon (king of Naples and Sicily ), Alfonso I d’Este (Duke of Ferrara), Charles II (Duke of Savoy), Francesco II Gonzaga (Marquis of Mantua) and Ladislaus II (King of Hungary), in order to divide up his possessions and during the war of the League (1508-1516) the Riviera is occupied by French and Spanish troops, ill-wished by the population. 1570, 23 April, a ship of armigers leaves to go and fight against the Ottoman Turks at the Battle of Lepanto (7 October 1571), in which the Riparians distinguish themselves for their value; the battle is blatantly won by the Lega Santa but the allies of Venice not wanting to go further against the Ottomans make sure that soon they can return to strength. The Serenissima is left alone to face them in its colonies, in addition to the financial commitment already committed; this leads to the beginning of its decline, which also manifests itself in the administration of the Magnifica Patria, with the birth of banditry, which will severely affect the Riviera for a long time. 1580 the future holy bishop Carlo Borromeo comes to the Riviera on a pastoral visit, he will found a Monte di Pietà to pay teachers who educate the poor children of the area. 1796, 17 August, the Napoleonic troops arrive at Salò, which will soon lead to the end of the Magnifica Patria. On March 25 messengers come from Brescia, which had arisen in favor of Napoleon, but the Salodians decide to remain loyal to the Serenissima, then the Brescia and Bergamo troops attack the city but are stopped. On May 20, however, Salò gave to the French troops that took away the title and independence from Brescia; from that moment a union will no longer be reformed within the territories of the Riviera. Throughout the riviera there is agriculture, specialized in the high riviera in the cultivation of lemon and cedars. On the whole coast there is also the production of oil and wine in quantities equal to twice the domestic consumption. As for the cultivation of wheat, the campaign is able to cover only domestic consumption for four months a year. On the mountains there is also sheep and sheep breeding. In Desenzano every Tuesday there is an important market of fodder, while on Saturdays the market takes place in Salò, where every kind of merchandise is traded. Trading on boats across the lake easily connects the coastal resorts with those of Verona, Trentino and Mantua. The trade in fodder, which collects products from all over the Po Valley, is the source of a flourishing smuggling that will never be able to stop. Much of medieval history is occupied by the presence of two great institutions, the Papacy and the Empire, engaged in the affirmation of those who considered themselves to be their rights; between these two realities the Municipality makes its way, which from time to time must confront the dominant authority, but which constantly aims to conquer its autonomy; … .. all this can be said of the Community of the Riviera di Salò. His story is full of facts that, all together, were nothing more than the expression of the desire of the Riparians to establish themselves in a real state … (A. Faedele).